The Innovation Jams help Temenos to identify the very best fintech companies, those that add real business value to its customers. Following the success of previous years’ events, Temenos is holding a series of regional Innovation Jams to showcase the most impressive demos of financial services software to financial institutions. 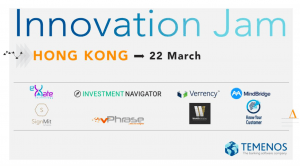 Signatys is proud to be selected by Temenos to pitch at their next Innovation Jam in Hong Kong. We will get the chance to showcase our SignMit solution and compete for a place in the final at the Temenos Community Forum in Dublin in May. It’s unique and great opportunity for us to expand in Asia when we know the huge potential of this market. We are looking forward to show them our achievement with Swiss banks, as well as the proof of concept made with Temenos and especially with their WealthSuites solution.